On this episode, we reminisce about Pleasure Island: “fun for all and all for fun!” This is part 2 of a two-part series. Be sure to check out MOW #255 for the first half of this discussion. Pleasure Island was a place where adults can go to be adults and still remain within the ‘bubble.’ It was a sprawling metroplex of nightclubs, bars, restaurants, adventure, comedy, and a New Year’s Eve celebration every night. We lived through it and perhaps even grew up in it. We hope to give you a unique take on the history of this place through the extensive research conducted and stories from our own personal experience. Who has experienced Pleasure Island? We would love to hear your stories. Let us know at show@magicourway.com. Your opinions are always welcome on our show. Seriously, every opinion is welcome. Give it a listen, ya’ heard! We appreciate your support. 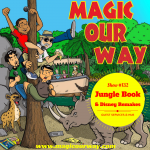 The Magic Our Way podcast is a New Orleans based Disney-fan podcast that has been in production since November 2012. Danny, Kevin, Eli, and Lee discuss all things Disney from the theme parks to the movies and much, much more. We allow all opinions (and not just the sugary, fluffy ones) to be voiced on the podcast and we always look at all sides of a topic. 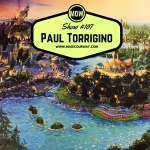 The “Pleasure Island of Disney-fan podcasts” is good for your morning and afternoon commute and all times in-between, but not at bedtime because we’ll keep you up! Please note: the Magic Our Way Podcast is not affiliated with the Walt Disney Company or its entities. All opinions expressed therein are solely those of the Magic Our Way podcast. No animals were harmed in the making of this podcast. 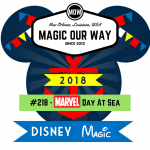 The Magic Our Way Podcast, Magic Our Way LLC, Kevin, Danny, Eli, and Lee do not own the rights to any of the clips in this show and is presented using Spotify for entertainment purposes.